Using the daily data collected through Kantar GeoPoll Media Measurement , GeoPoll has analyzed the top radio stations in Kenya for the past three months from May 1st – July 31st. We examined both ratings* and share** for the top stations in Kenya. The below chart shows the average ratings for the top 10 channels during the day from 06:00 to 22:00. Citizen radio maintained high ratings throughout May – July, with sustained high ratings throughout the day. Radio Maisha and Radio Jambo are second and third overall with higher ratings in the morning between 06:00 and 10:00. when their popular morning shows “Maisha Asubuhi” and “Gidi na Ghost asubuhi” air. GeoPoll also examined average the entire period from May 1st – July 31st. 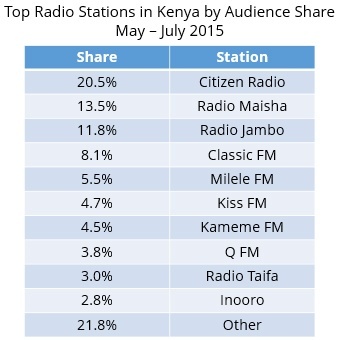 GeoPoll found that Citizen Radio controls ¼ of the listenership followed by Radio Maisha and Radio Jambo. Radio Jambo which, previously ranked 2nd has slipped to number 3. Due to the prevalence of local and smaller radio stations, 21.8% of listeners on average are tuned in to stations other than the main ones listed below. The full ratings from February to April can be seen in our last report on radio listenership in Kenya. To view more data on audience size, ratings, and share of radio, TV, or print in Kenya contact us by clicking below.